Foodbuzz.com is a site for food bloggers. Both average, everyday people and skilled cooks whose lives are spent in the kitchen. The one common factor is they love to share their passion. Back in March of 2009, after a conversation with a good friend who had begun a cooking blog, I joined this community. As I look through so many of the contestants, I know that I have not been as prolific here on my food blog as I have been on my everyday blog and my music blog. Yes, I also write a music blog and host a show on BlogTalk Radio about independent musicians. Music and food...my passions in life. They have been since I was a child. I have vivid memories of sitting in the kitchens of both my grandmothers and my mom and watching them as they created wonderful meals. As I got older, I was there with mom rolling meatballs on a Sunday. Watching as she painstakingly added wonderfully aromatic ingredients to create Sunday gravy or another meal. What do I share on Mangia Y'all? Well, I have a three part video on making lasagna...friends laughed at it's length and looking back, I could have edited more...but as I am verbose in my writing, I tend to be that way in real life. Walking into my kitchen with nothing planned for dinner and then opening the cupboards and freezer to see what is available and creating a meal from thin air is a challenge I throw at myself from time to time. I am me...nothing more, nothing less. I am not going to recreate an entire cuisine and change the way the world cooks. What I will do is show you tricks, explain the differences in taste of various ingredients and give those who read me a new idea to treat your family and friends. I have been told I am successful in explaining techniques in simple terms for those of my friends who are not kitchen friendly. This makes me smile. Cooking meals for friends is always a challenge, and in this case, I add extra challenges to myself. Normally, if you are coming to my home for dinner, you will be served something I have never tried before. Why? because I find it fun to try new foods with friends...and my friends now know they are guinea pigs when they accept an invite. When I am cooking I keep my camera close so I can record the steps. "Mangiare Bene e Piacere" or "Eat Well With Pleasure"
I realized that I have not swapped over to the new format for this blog and will have t do so over the next few weeks. 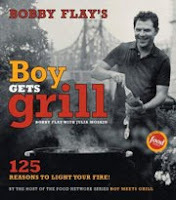 A beautiful Saturday night and a need for some seafood brought us to reach for one of my favorite books for cooking on the grill - Bobby Flay's "Boy Gets Grill". I flipped through looking for something that caught my fancy and three recipes jumped out. They were "Tomato bread With Prosciutto", Grilled Sea Scallops With Papaya-Tomatillo Salsa" and Grilled Clams In The Shell With Serrano Ham". Having an International Market within 20 minutes meant I knew I could get the tomatillos, papaya, and the seafood needed for the recipes. We had an abundance of tomatoes from the garden of Nancy's brother, so the Tomato Bread with Prosciutto was an easy choice. I did substitute Prosciutto for the Serrano Ham with the clams to keep the flavor consistent across all three dishes. Combine tomatoes, garlic, olive oil, salt and pepper in food processor or blender. Brush the bread with olive oil on both sides. Sprinkle with salt and pepper. Put on grill about 1 minute per side to char lightly and get those nice grill lines. Generously brush each slice with the tomato puree on one side, add a slice of the Prosciutto and serve immediately. I think I would have put more of the puree on next time. there was left over puree which we warmed to room temp and just used as a dip for some more of the left over bread the next day. "Grilled Sea Scallops with Papaya-Tomatillo Salsa"
Let sit at room temperature for at least 20 minutes. (Can be made a few hours in advance and refrigerated. bring to room temp before using). Grill until crusty brown on both sides and cooked through, 2-3 minutes on each side. I used a grilling basket for the scallops. Remove to a serving platter and spoon salsa on top. "Grilled Clams In The Shell With Prosciutto"
Remove clams to a platter, stuff with a piece of Prosciutto and drizzle olive oil over entire platter. The corn on the plate was also grilled in the husks (after removing the silk and soaking in water for 20 minutes. Actually it is all very simple, with just about a half hour or so of prep...and on a nice summer day...the lightness of the seafood, combined with the juiciness of the salsa is a wonderful dinner idea. This is the third of the series from a weekend o cooking about a month ago. In PART 1 we described how it all came about and prepared "Chicken in Sherry Cream Sauce". In PART 2 last week we shared the recipes for "Pork Chops In Mustard Sauce" and "Beef & Spinach Patties" and discussed how we prepped the food for freezing and reheating. "GROUND BEEF AND MACARONI MEDLEY"
Serve in bowls with grated Parmesan cheese to spoon over servings. This is great for a mid-day snack for the kids...for dinner with some nice crusty rolls and a green salad. Simple and quick...and freezes easily. Frozen in the Food Saver bags, I put this in lightly boiling water for 30 minutes and it was ready to go. Rub flank steak with mustard, thyme, salt and pepper on both sides. Place in a large baking dish and pour in wine and oil. The next day, saute onion and garlic in butter until soft. Add cornbread stuffing and egg to skillet and stir until mixed thoroughly. Remove flank steak from baking dish and place on cutting board or counter (spread wax paper on the counter to allow for easy of cleanup). Arrange pepperoni on entire surface of meat. Spread the stuffing mixture over pepperoni. Sprinkle with olives and chiles. Starting from the long end, roll up the meat, jelly-roll fashion. NOTE: some of the stuffing will seep out the ends, no worries about that. Tie with butcher string in 4 or 5 places. Return the meat to the baking pan with the marinade and cover with foil. Remove the foil and bake for 30 minutes longer basting with the marinade at least 4 times. Remove from the oven and recover with pan with foil and let stand 10 minutes. I served it with some steamed green beans and rice. Be back next week with the final chapter in this day of cooking! We spoke last time of preparing a number of meals at one time for freezing and today we continue that story. To recap, we cut all the vegetables needed for all the meals and prepped all ingredients prior to beginning. "Pork Chops With Mustard Sauce"
Dust pork chops lightly on both sides with this mixture. Add pork chops and cook over medium heat for 6 minutes per side or until pinkness is gone when cut in center. Remove pork chops and keep warm. Slowly add the wine and broth, stirring briskly. Pour sauce over Pork Chops and serve. I served them with a nice baked yam and sauteed artichoke hearts...yummo! When cooking in bulk, you must be able to freeze the meals for future use. There is no better way to freeze food than with the Food Saver System. I am advocating the use of this tremendous machine without any compensation whatsoever. I have owned one for many years, but for our wedding we received the newest model and the company must be credited with their innovations. The new machine is vertical, so it takes up very little counter space. It has two different speed settings, so you can now seal softer foods without squishing them. It also has a moisture setting which recognizes the presence of moisture and cuts the vacuum off and seals without sucking the liquid into the machinery. I have found putting the sauces into the small snack size zip-lock bags works wonderfully. If you just put the sauce into the same bag as the meat, the sauce gets absorbed into the meats and you do not have enough when serving the meal. In this case, I made of 3 packages containing 2 Pork Chops each with a zip-lock of sauce and then 3 packages with one Pork Chop and sauce. The first is to let the meal defrost and then you can either put the meat into a casserole and put it into the oven at about 300 degrees to warm or you can put the pouch into a pot of water that is simmering on the stove and let it heat for about 15 minutes. When you are ready to serve, take the gravy out of the small zip-lock and put it into a small bowl, stir and microwave for 60 seconds. The second method, for when you do not have time to defrost is to put the whole pouch into a pot of lightly boiling water on the stove for about 30 minutes. The meal should be defrosted and warmed. Once again, take the sauce and put into a bowl, stir and microwave before pouring over the meat. This recipe makes 4 servings and can be halved or doubled. When doubling, only use 3/4 cup of red wine. Saute the onion and mushrooms in 2 tbsp. of the butter in a large frying pan until soft and lightly browned. Beat the egg and then blend in the bread crumbs, onion mixture, ground beef, spinach, 2 tbsp. of the red wine, the salt and pepper. Shape into 4 oval patties, each about 1-inch thick. Using the same frying pan add the remaining 1 tbsp. butter and brown the patties about 4 minutes per side until well browned, turning only once. Remove the patties to a platter and keep warm. Add the remaining 6 tbsp. red wine. Cook stirring to mix in all those most excellent drippings left in the pan. Boil about 30-seconds and pour over the patties and serve. As we did above with the Pork Chops, We put two patties into each Food Saver Bag and half the red wine sauce into a small snack size zip-lock bag and then sealed them for freezing. Like what you see here? Let your friends know and share the love and share the link! Taking a whole day and preparing meals for a month's worth of eating is something I have always enjoyed. It has not been possible since I moved South, as I have not had the necessary freezer space for this event to make sense. Recently, my bride and I had a garage sale after combining our households and after it was over we purchased a 7.2 cubic foot chest freezer. As a wedding gift, we also received the newest Food Saver which has settings for moist foods and is more automatic than the older models. I love my Food Saver and have had one for many years. They allow you to freeze food and then, when you are ready, to eat a meal that tastes as fresh as the day it was made. That is 47 individual main courses (and in the case of the two casseroles, a full meal), and the entire food bill was under $80.00 for all of the meats. We did go to Costco for the meats, to take advantage of their discounts on larger portions. We had much of the vegetables and spices needed to complete all of the meals, so that saved on costs. Additionally, I boned my chicken breasts thus saving the additional costs associated with buying the chicken boneless. First step in this whole process is to make sure you have at least two cutting boards. One for your meats and one for your vegetables. Then cut up all the veggies for all the recipes. Every recipe I made called for onions in some form. I had a big bowl and I chopped the onions one at a time and put them in the bowl separated by a piece of wax paper. This way I grabbed one layer for every onion required. I did the same for the celery, peppers, mushrooms, potatoes and all the other veggies and herbs needed. Then I began to work with the meats. Having reviewed all of the recipes, I put them in a very loose order for prep based upon cooking methods, times, and temperatures. The Chicken was prepared Friday evening, so we will address that first and then in our next edition we will deal with half of Saturday. In the final part, we will address the remainder of Saturday and the storage of all the meals. "Chicken In Sherry Cream Sauce"
We served it this night with rosemary roasted potato wedges, steamed green beans and - OF COURSE! - crusty bread!